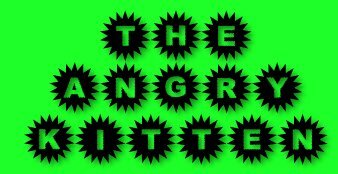 Who is the Angry Kitten? was completely exhausted and had lost all of my steam. Still, I had a scowl on my face and was swinging wildly. "Rachelle. What you doing? You fight like angry kitten." I never really felt tough after that. 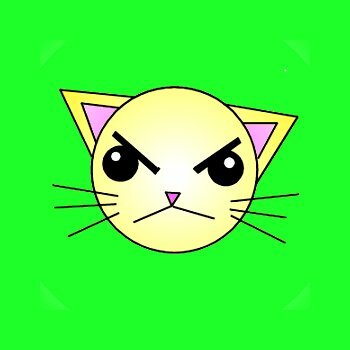 Now, I am the proud owner of www.TheAngryKitten.com. making them lately, so some of this information is a little dated. The picture on the button is the Angry Kitten depicted above. For an extremely modest fee, I would be happy to send an Angry Kitten to live with you. He will not spray your furniture. He will not scratch your antique, mahogany armoire. He doesn't have claws or even a body, for goodness sake. He's just a wicked little feline head, as you can see. All information and images on this page are Copyright 2004-2019, by Rachelle Rose. More designs might come later. Some will be angry. Some will not. But click HERE to see my page on Instagram, which is also known as THEANGRYKITTEN.